Most students at university campuses either don’t need to drive, don’t need to own cars. Yet the isolated dormitory, classroom and cafeteria zone form of development, similar to the isolated subdivision, office park and shopping mall model of suburban development, surprisingly hasn’t changed for decades. Until now. Finally. 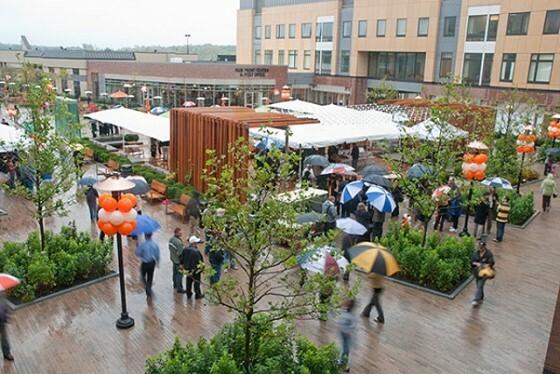 Thanks to the forward thinkers at the Rochester Institute of Technology in Rochester, New York, they not only invested $54 million into an open-to-the-public mixed-use destination urban village in the middle of campus, they centered it around the equivalent of a car-free piazza. The 189,000 s.f. LEED-certified Global Village features 20,000 s.f. of retail space (with a restaurant, convenience store, copy center, post office, fitness center) and 12,000 s.f. of academic space surrounded by 414-bed apartment and suite style student housing. What ties it all together is the central plaza, designed to promote outdoor activity and social interaction. A casual and formal outdoor restaurant and cafe fills outdoor seating for 200, while an outdoor living room/lounge with a fire pit and small performance area attracts crowds at all hours. During the winter, the outdoor lounge becomes a small skating rink. What puts the “global” in Global Village? The complex hosts multi-cultural programs and the university’s study abroad group, and houses students participating in co-op programs in countries such as the UAE, Kosovo, and Croatia. Foreign students are also provided with a variety of amenities. The academic spaces also include an Entrepreneurial Center and a Prototype Lab space. “The plaza is a huge success. We had kids sitting outside deep into the fall, which, given our weather, is exceptional,” James Watters, RIT senior vice president of finance and administration. “The attractiveness of the new neighborhood is expected to give the university a competitive edge in recruiting, Urban Land Institute. “The project shows that an exciting, sophisticated street scene and residential neighborhood can be created on a prestigious campus that hasn’t historically had this nearby. There’s a real hunger among faculty, staff, and students for close-to-campus neighborhoods with urban energy, and at most universities, no one has had those kinds of neighborhoods for over 50 years.” Marco Esposito, SWA Group (urban design firm). While the Global Village is located on a suburban campus, even better, you can bring a university urban village to a downtown. Ten years ago, the University of Washington in Tacoma, Washington redeveloped abandoned warehouses on eight blocks of the city’s blighted industrial waterfront into an urban village of classrooms, student housing and 6000 s.f. of commercial. Serving 3500 students with a goal of 10,000, the development has spurred a downtown revitalization. Ryan Petty, the city’s director of community and economic development, refers to the university’s location downtown as “the best decision the city has made in the past 30 years,” resulting in “seeing a lot of new businesses locating downtown.” Now it’s one of the liveliest districts in the city. Thanks to the ULI for the source of this post.